Growing up a 90s kid, I was absolutely in love with the Disney classic Beauty and the Beast. Loved the characters, loved the songs, loved the magic. 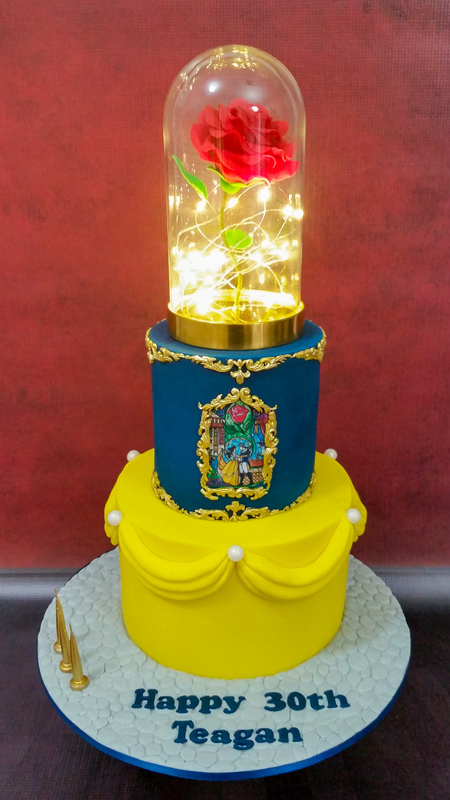 I was so excited when recently a Beauty and the Beast themed cake order fell in my lap – and I was offered the chance to design it however I liked! * BEGÅVNING Glass dome with base from Ikea (AU$9.99) – FYI, in this picture it is sitting on top of a 5″ cake. So you would want to be placing it onto the top of at least 5-6″ cake. Construct sugar rose with leaves. Use floral tape to cover stem wire. Drill hole into centre of base, large enough to fit rose stem & fair lights wire through. Feed the lights through the drilled hole from underneath the base. Apply some hot glue to the hole, and place the rose stem through. This will hold the rose and the lights in place. (I added a couple extra dots of hot glue in places to secure the LED wire to the base in a couple places). Play with the fairy lights wiring until they are arranged how you like them. I decided to keep the lights below the rose so they did not pose an obstruction to viewing the rose itself. Dollop of hot glue onto the base behind view of the rose, to secure the glass dome in place. Hope this is helpful for people out there wanting to have a go at making one for yourself. As you can see, it’s something that is very effective but doesn’t break the bank to make if you have the time to spare.